I know right. Another nail post. But don't worry, I'll be laying off the nail posts after this one to concentrate on more interesting things, I promise! The reason I'm putting this one up though is that by now some of you may already know that I'm obsessed with iridescense. From lampshades, to parkas, to makeup bags, to eyeshadows and now, to nails! Around this time last year I posted a face of the day featuring an explosion of iridescent shards on my face (HERE). At the time I thought it'd be pretty cool to apply them to my nails too, but I never really got around to it. 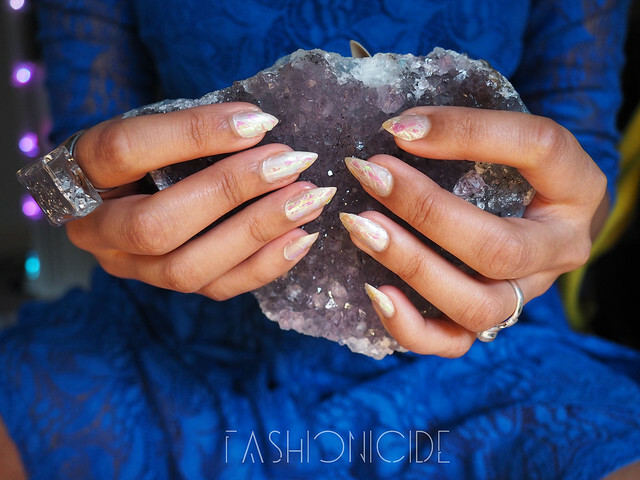 Then a couple of weeks ago I came across Shattered Glass nails, and it re-ignited the idea in my brain. What I love most about this particular effect on the nails is how it's a bit two-faced, in a way. Up close, it's pretty clear to see that I've stuck some bits of iridescence on to the nails, but from afar, that's where it really shines. 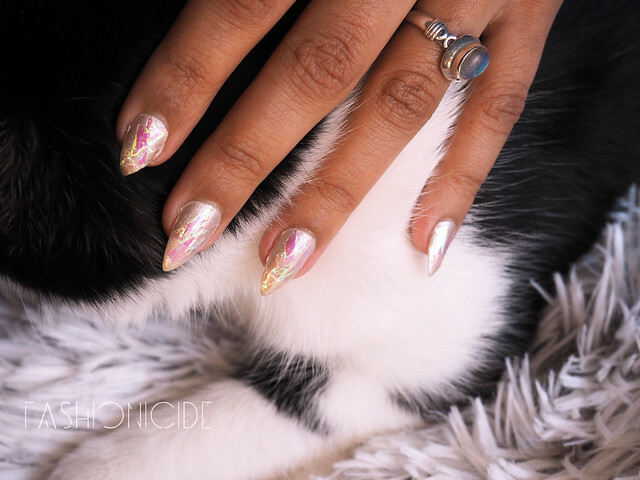 When you catch a glimpse of the nails in a more normal, day to day context, they have that ethereal quality I always associate with iridescence. They look pretty damn magnificent, and the gleam attracts attention - "What exactly is that on your nails?" The technique is simple, however I went about it a little differently. Firstly, I applied two coats of Barry M's Pearl. Oh Barry. I didn't even realise Barry was an actual real-life person until yesterday, I always thought the Barry M moniker was just another Sally Hansen style front, and then when I googled him I saw that he passed away last year. I digress! Once Barry's delicious Pearl polish was just about touch-dry, but not quite fully dry, I cut up some shards of iridescent material. This sounds easy, but actually it's a complete ball-ache. The pieces need to be small enough to fit my nails, and when you start cutting it all up, some of the bits seemingly vanish into thin air. No matter though, they will turn up probably stuck to your forehead, weaved in to the carpet or on the cat's tongue*. If the cutting thing is too annoying though, you can purchase some pre-cut shards HERE. After removing the pieces from my forehead, the cat's tongue and anywhere else they might appear, I apply topcoat to the first nail and use tweezers to carefully place a few shards onto the nail. Then just work your way through your fingers until all of your nails are covered. The topcoat acts as a kind of glue for the shards to latch onto, however if any of your shards verge over the edge of the nail, just clip off the excess with some nail scissors. 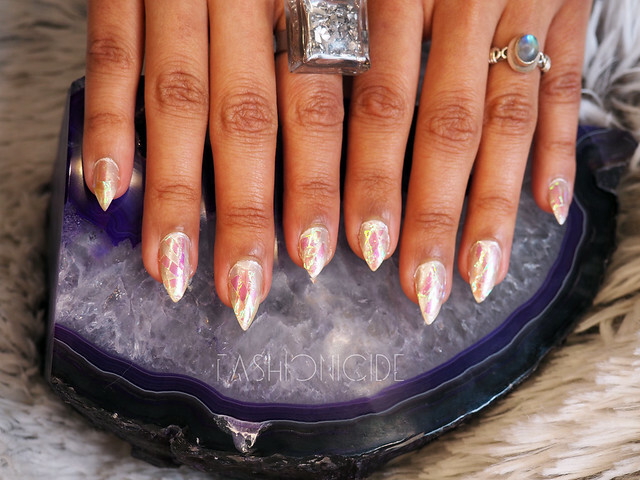 The only issue I've found with having shattered glass nails or glass nails (as they're sometime called) is that after a day or so, the iridescent shards begin to peel off around the edges. 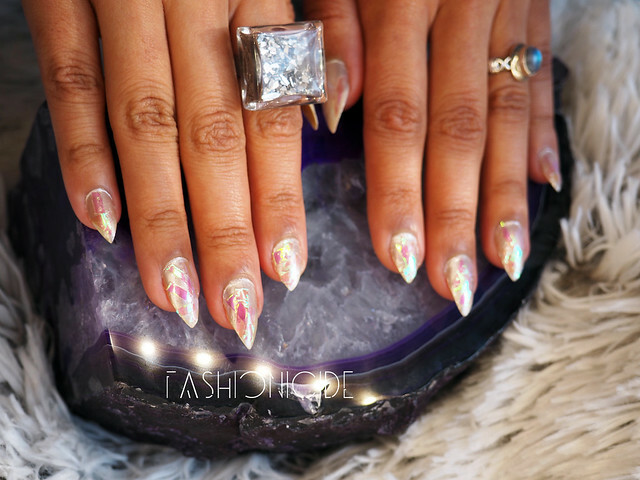 So there you have it, my Iridescent Shattered Glass Nails! **Please note that I did not get burgled, have never been burgled and neither do I advocate using this rock as a weapon against burglars. If anything, you should use a shotgun and blow one of their legs off. I love nail posts, and yours look gorgeous! I want to try this, hopefully I won't make a huge mess...lol! These are amazing girl. I would end up with pieces everywhere, I'm impressed you managed it with slightly wet nails too! That's got to be some sort of skill. Even more impressed with your talons, I love the shape. I had to buy myself some fake ones to stop me picking at mine again. Some habits are hard to break!